The title of this post is meant in every sense. It is both a command and an indicator of what will follow. Download the latest data from the database as .csv using our online portal’s simple export utilities. Read the .csv file into a pandas DataFrame. In doing this, I also had to specify a number of options so that pandas would assign the types to different columns correctly. Filter the data in various ways. For example, removing artifacts that were marked as “discarded” in the database. Finally, do the actual analysis that I wanted to do. While that isn’t a terrible way to go about things and can be done in Jupyter Notebooks if one is careful, steps 1-3 get repeated in slightly different ways in almost every notebook. Ideally, I want to avoid that repetition. I also wanted something that I could share easily with my colleagues and other researchers. So I decided to start building a leiap package. That way, all I’d have to do was import leiap and I’d have access to all of the code I’d written before. My first task was to separate my code into roughly-coherent modules in order to keep things organized. So far I have io.py, checks.py, fieldschool.py, mapping.py, progress.py, report.py, spatial.py, and time.py, all of which contain a series of functions that do the tasks which used to be housed in Jupyter Notebooks. The io.py module is especially important because its functions allow me to pull data from the database directly with ODBC connections, thus avoiding the .csv downloads. After I had everything more or less organized, I didn’t really know what to do next. I found this Packaging Python Projects tutorial and the companion sampleproject GitHub repo very helpful for figuring out what __init__.py and setup.py files are and how they should be structured. The setup.py file in the sampleproject repo is especially well-commented and clear about what needs to be included and what is optional. 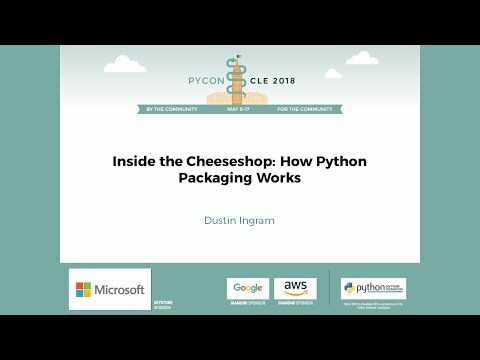 I discovered both of those links as a result of this PyCon talk from Dustin Ingram. The final destination for most Python packages is probably the Python Package Index (PyPI). Once it is there, it can be installed easily by anyone with pip commands. To put it on PyPI, you need to generate distribution archives, which are the actual files that install the package. However, because the leiap package allows access to the database, I do not want it to be public on PyPI, but I do want to share the package with my collaborators. So, to make it easily installable for them, I went ahead and created the distribution files anyway. They can then install the package from the distribution files saved locally on their machine. From there, the package should work exactly as any other package you are used to like pandas or numpy. Common IDE features like help and tab-completion should work as expected. So there you have it. Some hacked-together code that crudely imported .csv files and was scattered across various Jupyter Notebooks now exists as its very own Python package, ready to be shared and installed wherever it’s needed.